Yes. Yes there is. And here’s how it’s done. Sure, there are logical ways you can get your kids to sleep in their own rooms. Letting them choose the bedding so they are excited about the bed is one way. Creating a reward chart so they receive a small treat or sticker every night they sleep in their bed is another great idea. And of course, there’s always the exhausting bleary-eyed shuffle where you lug them back to their own bed. But we like these innovative ideas much better. Lace the front entrance to your bedroom with Lego pieces. Hopefully as soon as they step on one, they will turn back to their own beds. Buy a wig similar to your own hair and place it on the pillow beside your child. That way he may just think you are asleep beside him. Tape maths equations to the front of your bedroom door. Tell the kids they have to get the equations right in order to come in. Sleep with a Darth Vader mask on. The combination of the loud noise and the creepy mask may just be enough to convince them it’s best to sleep in their own rooms. Set up an obstacle course of soft cushions, pillows and blankets in the hallway from their room to yours. If the space is soft enough, they may just fall asleep on the way to your bed. Sure, you may find them asleep in the hallway… but, hey, at least your bed is empty! 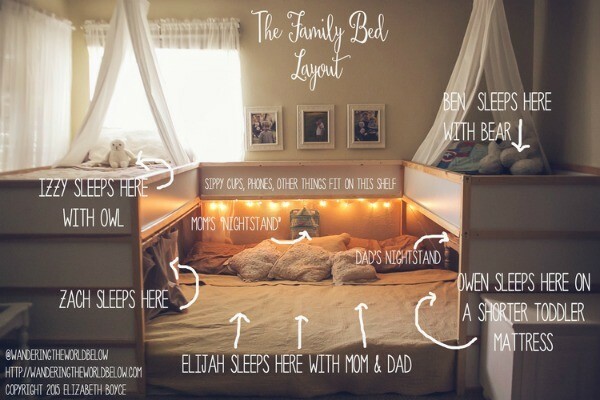 Consider a DIY co-sleeping bed like this clever family did. They manage to fit five children and two adults all in the same bed. Crazy, yes, but for some, co-sleeping is the only way to get a decent night’s rest. How do you manage to keep your kids in their own beds all night? Or do you constantly find yourself sharing your pillow with your little ones?